Being able to calculate accurately isn’t enough to prepare students to successfully solve complex problems both in and outside of the mathematics classroom. This new series builds students’ confidence in their ability to solve problems by teaching them to uncover what needs to be done rather than simply looking to apply a specific strategy. 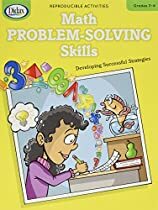 Each book features over 50 activities involving spatial visualization; logical reasoning; interpreting, organizing and using information; strategic thinking; using patterns; proportional reasoning; and much more! The teacher notes identify the NCTM strand for each activity, the specific problem-solving strategy to be used, necessary materials, and ideas for discussion and extension. Each book 120 pages.